M9100 Multi Solar Battery Test System, as a simple operation and practical control software developed by Maynuo Electronic Co., Ltd., is applicable for multi-set of M97 series electronic load of our company to test for multi-channel solar battery in parallel. 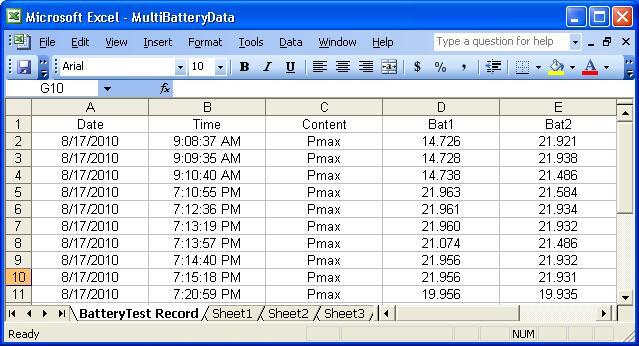 By this software, our users can not only track the maximum power (Pmax) accurately, but also save in real time and export the test data to Excel sheet. 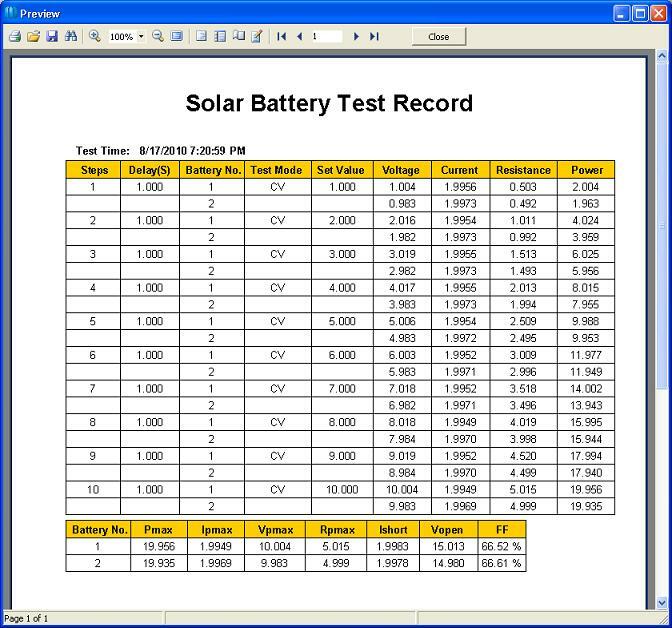 It is really a professional software for solar battery test and data analysis. The growth of the solar energy industry increases the needs for test solutions about the solar battery (and solar module). Besides, with the increasement of battery size and improvement of solar battery working efficiancy, battery test requires a kind of equipment which can provide bigger current and higher power. Our M97 series electronic load is complete in model, with power ranging from 150W to 200KW and current ranging from 15A to 1500A, which can defintely meet solar battery's (and solar module) requirements for power and current. Vopen---- Open-circuit voltage, is the battery voltage when the battery current is 0. Ishort---- Short-circuit current, is the current drawn from the battery when the resistance of electronic load is 0. Pmax---- The maximum power of the battery. The Pmax point in I-V curve is usually called the maximum power point. Ipmax---- The current value when battery is in the maximum power Pmax. Vpmax---- The voltage value when battery is in the maximum power Pmax. Rpmax--- The resistance value when battery is in the maximum power Pmax. FF---- Fill factor, is the ratio of Pmax to the Vopen and Ishort, that is, Pmax/(Vopen*Ishort). FF is an important parameter which effects directly the solar battery performance. The bigger the FF value is, the higher utilization of solar battery to light is. Rs---- The series resistance of the battery. Rsh---- The shunt resistance of the battery. M97 series electronic loads can work in constant voltage mode which is also known as CV mode. When in CV mode, the electronic load can control the voltage across battery to a constant voltage by adjusting the current flowing through itself, so CV mode can be applied to the voltage scanning. In each step scanning, electronic load can control the output voltage of solar battery and then measure the current it generated. So we can see that CV mode is the best mode for solar battery test. Of course, you can aslo use CC/CR/CW mode according to your test requirements. Nanjing Maynuo Electronic Co., Ltd grasp this opportunity, further its technical research and developed M9100 multi solar battery test system based on the outstanding quality and high cost-effectiveness of its main products---M97 series programmable electronic loads. M9100 multi solar battery test system is the most cost-effective among all the similar products of the test industry, so it occupies the solar battery test market quickly. Since there is a big difference with the light intensity between day and night, the maximum power Pmax of a day also differs much. And the test accuracy of the traditional test mode is very low when in such a broad range of operation; thus, it is very difficult to meet solar battery test requirements. Under such circumstances, Maynuo techinicalmen developed two-part intelligent search modes---- rough search frist and then exact search, by which the Pmax point could be found faster and more accurately. Besides, our M9100 software can also be set as unattended completion of automatic test in a fixed time. 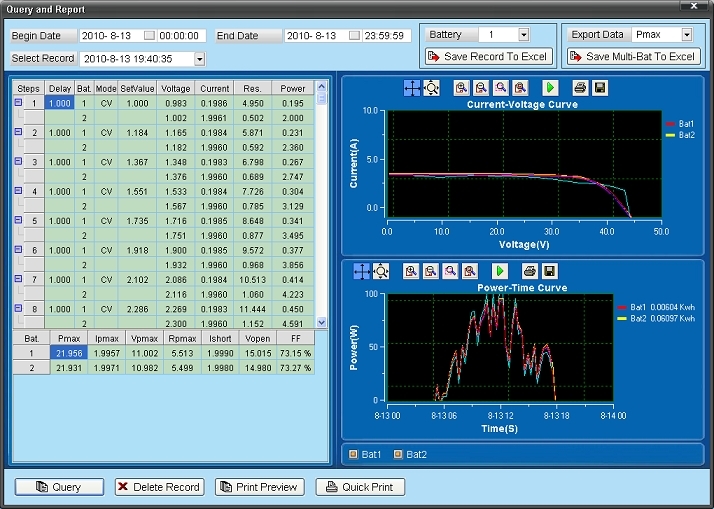 It is definatley meet solar battery test requirements for real-time tracking the test day and night. It can test kinds of solar battery parameters automatically in fixed time. Two timers can be started and the timed task can be executed once at the soonest of 1 minute. It can test out the following values: the maximum power (in short, Pmax), the current value (Ipmax), the voltage value (Vpmax) and the resistance value (Rpmax) when the load is in maximum power, the short-circuit current (Ishort), the open-circuit voltage (Vopen) and fill factor (FF). 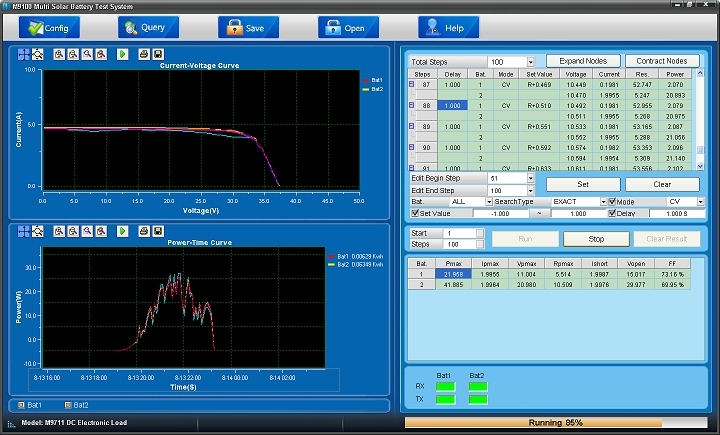 The test interface can real time show the I-V curve, P-T curve in the 24-hour interval when the load is in maximum power. The query interface can show P-T curve at any period of time. It can print out the test report you needed,and export the report to the Excel sheet. It supports multi-channel solar battery test in parallel at the same time. And the test speed is fast. For each battery with the same or different specifications, the test list can be set with different working mode(CV/CC/CR/CW) and different test parameters. For each channel, the biggest test steps is 1000 and the smallest step value is 0.001, and the accuracy is very high. Two-part intelligent search modes are provided---- rough search frist and then accurate search, by which the Pmax point could be found faster and more accurately. It is very suitable for real-time tracking day and night.